A few actual sample loveletters I’ve written to my wife have been made available for you to read. These are examples of love letters I’ve written to Carrie during our engagement, and throughout our 35 plus years of marriage. I gave this loveletter to Carrie when she went away for a weekend with her sisters only a few weeks before our wedding. Check out examples of love letters to help you get ideas for your own. Here’s a note I gave to Carrie when we had been married for a year and a half. Carrie said she really liked this card I gave her on our 24th wedding anniversary. 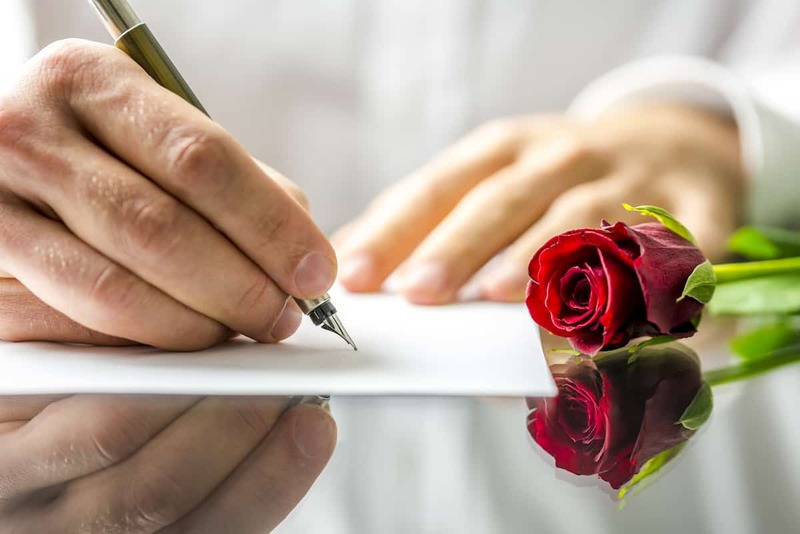 Combine ideas from our sample love letters with the following guidelines, and your love letter will help develop deeper romance and intimacy! Every love letter should have three distinct components; when you include all three you have the making of a relationship booster that will be meaningful and memorable. Miss one of the three and your letter will be placed in some shoe box in the closet and not treasured in the drawer of a bedside table. I love when you glance at me and smile from across the room. I love when you touch my shoulder when you pass by. I love the way you work so selflessly for our family. Occasionally include a love quote to add a special touch! 2. THE CONTEXT: what is surrounding the text? what is the environment around the words? Is it handwritten by special marker or lipstick on the bathroom mirror? Is it a love letter written on the back of a jigsaw puzzle? message in a bottle: This is the stuff memories are made of! (See “Message in a Bottle” with Kevin Costner) This one’s a little hard to handle logistically. Don’t bother using the bathtub to float the bottle! bathroom mirror notes: This is a nice touch. Use special colored markers for just this purpose! the letter hunts: Tell your wife (using a sticky-note or paper on the fridge) that you have five love notes scattered around the house. Looking out for them will simply make her day! the letter series: Multiple notes or letters for special occasions. a letter-per-day-when- you’re-away: revealing the location of a hidden letter, each day you’re gone on a business trip will make your wife eager for your return! the puzzle love letter: Invest time making a jigsaw puzzle. Then write a love note on the back of it. Put the puzzle back in the box and give it to your lover! letters of legacy: Use occasions like before marriage, on the occasion of a child’s birth, at the resolution of a crisis as opportunities to write love letters to each other. Read them, and put them away in a “legacy box” to be opened say, 10 years later–or at the celebration of an anniversary. love letter bookmark: Write a letter and place it in your husband’s book. The element of surprise is always a wonderful context for your note. newspaper love letter: Compose a love letter. Then find each word from your love letter in a newspaper. Start at the first page of the paper, circling all the words from your note in the same order as your note. You lover will need a pen and paper for this one! Your love letter needs to have occasional reference to a hidden meaning, a veiled reference, or a “story” that is assumed and understood by lovers, but others who read the letter would be oblivious to the hidden message. A very simple example relates to an old ’76 Ford I drove while going out with my date, Carrie (now my wife). One winter, the heater was broken. “Turning up the heat” was a rather obvious “hidden reference” to getting closer and cuddling. Referring to the ideas of text, context, and subtext, why don’t you use some of our sample love letters to craft your own sizzling love note? !